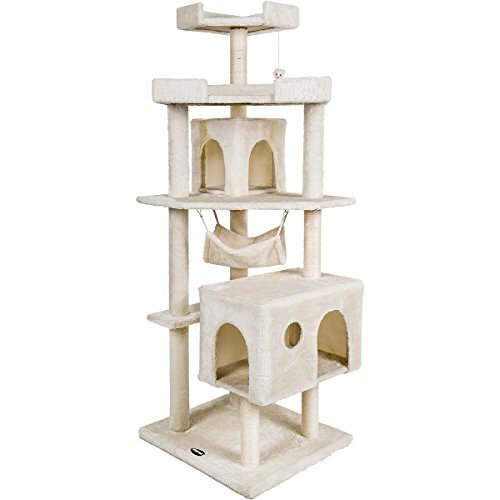 There are a lot of cat trees available for the average size cat. The problem with the standard furniture however is that it is often not supporting the weight of bigger cats. That’s why I now come with a list of cat tree furniture for big cats. Cat tree furniture comes in a lot of different shapes and sizes. A cat tree is a special construction, where cats can both play and sleep on a higher level than your average chair or sofa. A good amount of cats love to sit high up and perching over the area, feeling like a lion king on the top of the mountain. There are plenty of models that are okay to use for small to moderate or normal sized cats. Most models however are constructed with cardboard poles and plastic parts as well as structures supported by only one beam. That is fine for lighter cats, but the heavier sized big cats will make the cat tree fall over or break into pieces. More active cats, such as Bengals will also jump into and out of the cat tree, making the cat tree wobble or topple. We are not talking about 2-5 kg cats any longer, but cats that are well over 7 kg (15-20lbs). 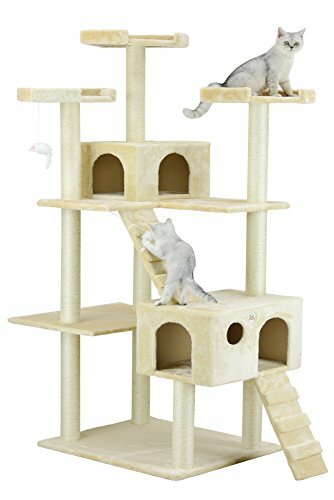 I have been strolling the internet for models that are supported for the super sized cat and so without further ado, here I present you my top 5 cat tree furniture for big cats. 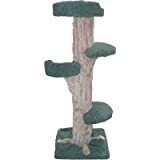 A sturdy cat tree with soft padded platforms and poles. The poles have also partly sisal rope for their scratching behaviour. The platforms are made of compressed wood. It has a sturdy base frame and four poles are supporting the rest of the structure, giving much support for medium to big cats. With five platforms, two houses and plenty of room to relax and play it is one of the better cat trees. 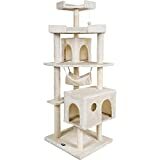 This very sturdy cat tree has a strong base and is built as a strong tower with two condo’s and on top a watchtower. 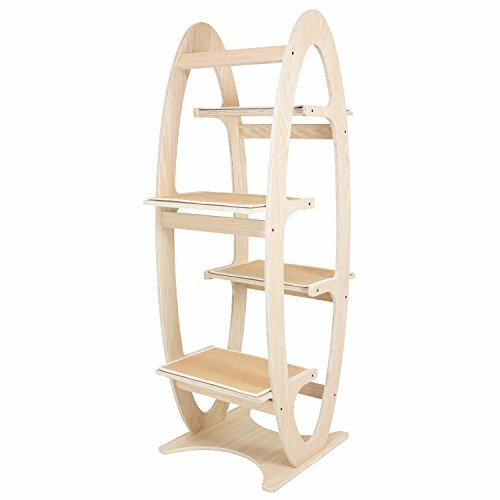 Because everything is built in one vertical line, it will be a sturdy structure for heavy cats and the more playful medium sized cats. 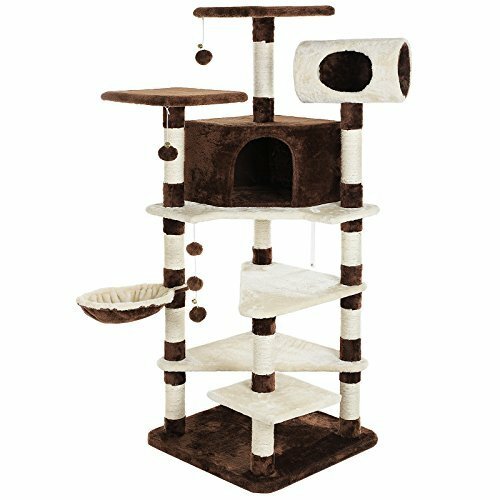 Another very sturdy large cat tree with several levels of platforms and condo’s / houses. The poles are made with a combo of sisal rope and faux fur. 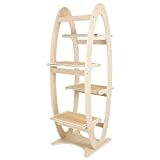 A 52 inch high cat tower of proper wood with carpet layered platforms for your cats to hang out at. This cat tree comes closest to a real tree with the right colours and texture. This very modern design for a cat tree is the modern way of having cats in your house. There are many platforms that your cats can hang out at, but there is no place to scratch for them (no sisal rope poles). It is also one of the more pricy cat trees, but, now it fits with your modern furniture! Most importantly, this cat tree is extremely stable as it is made of proper timber. 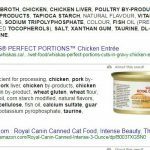 With this overview I hope to have given you an overview of what the alternatives are for you and your more heavy-built cats. Have you got experience with these cat trees that you would like to share or have you got questions regarding these and other cat trees? Please share them below! I’ve always wondered if these are designed with a material that attracts the cat like catnip? I have a 16 year old cat who acts like a 2 year old, sop hyper and youthful and he is always scratching our couches. Would be nice to have him scratch a cat tree instead. 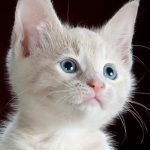 Cat trees do not come with catnip as far as I am aware, but you can use a special catnip spray or simply sprinkle some catnip on your cat tree, to attract your cats to the tree, rather then your furniture.